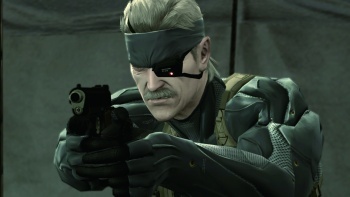 A movie based on the escapades of stealth master Solid Snake has been in the works for years, but the final product may never be released. The theatrical release of a Metal Gear Solid movie is looking very unlikely at this point, according to producer Michael De Luca. Despite rumblings last year that the movie was back in action, it probably will never happen. In an interview with Collider, De Luca said: "I don't think it's going to move forward because I got the sense that there may not be enough of a coordinated will at this point on the side of certain parties to see a movie get made." Who the disagreeable parties are was not elaborated upon, but Kotaku sources say part of the problem is a funding issue. Sony Pictures wanted to provide a certain amount of money to back the film with, possibly in the range of $40 to $80 million, but Kojima Productions and Konami felt it was too low. A movie can only hurt. If the movie's great, you're probably not going to sell more games. It's such a separate thing. The franchise being as big as it [is] kind of helps the movie...I'm not sure the movie does the same thing for the game. Metal Gear Solid is a huge brand that even held up the PlayStation 3 when it was arguably failing for a while, so a movie based on the series isn't exactly something you can throw out to Uwe Boll and then call a day. However, we haven't seen the last of Michael De Luca, as he also appears to be attached to the Preacher movie adaptation. Ah, the life of a producer, going from a gravelly-voiced mustachioed hero to a drooling teenager that blasted himself in the face with a shotgun.